Select the SSL Digital Certificate that best suits your needs. All certificates can be managed with our Control Panel and all Comodo Certificates includes a trusted Comodo logo. We offer money back guarantee for the first 30 days. 24 x 7 support is included and we help you to get your Certificate correctly installed. For any questions please contact us via our Contact form. We will be delighted to answer your questions. SSL Certificates are an essential part of the internet. They not only encrypt communication between your computer and the server where a website is located, but they also provide verification that a site is what it claims to be. 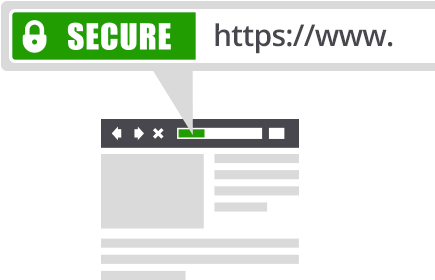 Additionally, the worlds most popular web browser Chrome from Google has recently announced that from July 2018 all websites offered without HTTPS will be marked as not secure and will be highly penalized for Search Engine Optimization. There are 2 different levels of vetting that SSL Certificates are based upon. Domain Validated (DV) and Extended / Enterprise Validation (EV). The major difference between the types of certificate relates to the information the Certificate Authority Comodo requires and validates in order to issue a certificate. The higher levels of certificate require more information, and often is displayed in the browser bar. EV SSL for example turns the browser bar green and displays the organization name to visitors to generate more trust. How long does it take for my ComodoSSL Certificate to be issued? Domain Validation certificates are generally issued within minutes or hours, after whois domain data verification and owner approval. Enterprise Validation certificates are usually issued within 2 Business days but can take up to 7 days or more as Comodo will request you to provide Business verification documents and finishes the process with a phone call verification. Yes, Comodo SSL Certificates are compatible with almost all desktop and mobile web and text browsers. To ensure compatibility, please remember to install the CA Intermediate Bundle included with your SSL Certificate. Not sure which Comodo Certificate plan to choose?